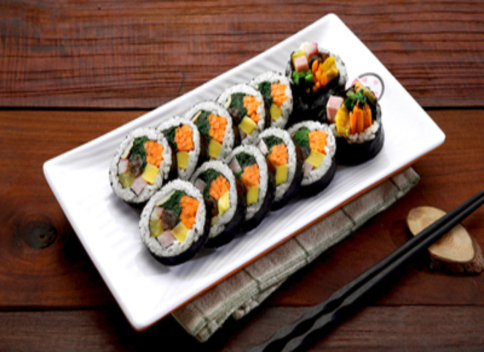 김밥(gim-bab/Korean Seaweed Roll) is one one the most popular street foods in Korea. It was traditionally a picnic food, which was enjoyed by children on school picnics. These days, so many김밥(gim-bab) restaurants have opened. Now, you can get 김밥(gim-bab) whenever & wherever you want. But when I was a child, you could only have 김밥(gim-bab) on special occasions. 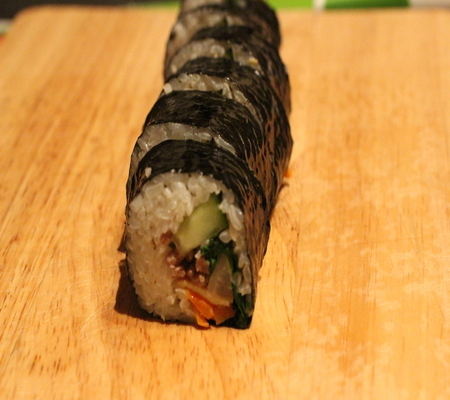 김밥(gim-bab) looks a lot like a sushi California roll. 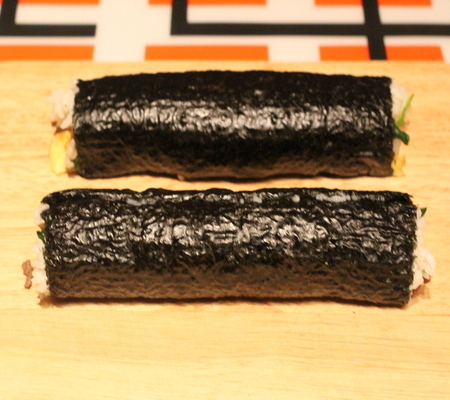 The outside is the same – rolled seaweed. 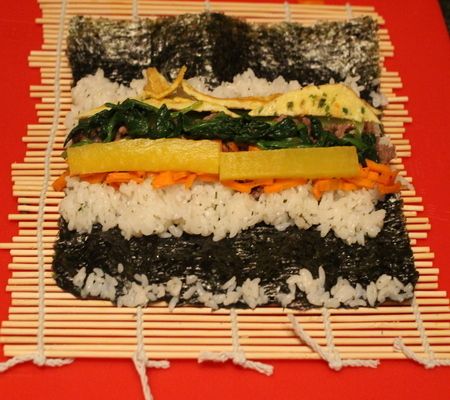 However, inside it is rolled with colourful ingredients, such as pickles, meat & egg. It is a beautiful dish, but takes a little time to prepare all of the ingredients. 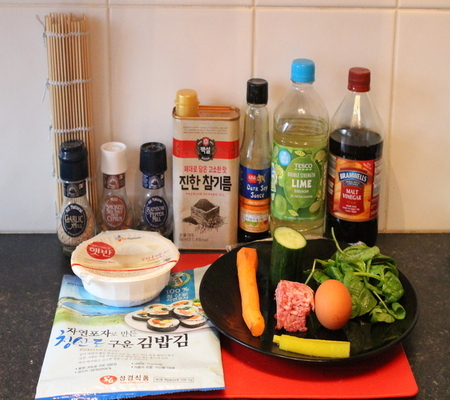 When we would have a picnic, my mom used to wake up early and prepare the ingredients for my 김밥(gim-bab). It brings me nostalgic memories of picnic days of my youth and my mother’s love. 1) 김밥 밥을 준비한다. 두 공기 분량의 밥을 큰 볼에 넣는다. 소금, 설탕, 후추, 식초를 넣고 기호에 따라 약간의 라임즙이나 허브(파슬리나 코리앤더)를 추가한다. Prepare the rice for gim-bab. Put two bowls of sticky rice in the mixing bowl. Add salt, sugar, pepper, vinegar and hint of fresh lime juice. You can use whichever herbs you prefer. 2) 당근을 얇게 썬다. 황갈색으로 변할 때까지 볶아준다. 간 쇠고기도 볶아준다. 볼에 계란을 깬 다음 잘 섞어준다. 프라이팬에 얇게 펴서 익힌 후 길게 썬다. 오이도 길고 가늘게 썬다. 시금치를 살짝 삶은 후 물을 짜 없앤 다음 소금, 후추, 간장, 참기름으로 간을 한다. Chop carrots into long, thin strips. Fry them until they turn golden. Pan fry the minced beef (and remove the fat). Crack the egg and beat well, pour the mix into a pan as if you are making an omelette. When it is cooked, slice into long, thin lines. Slice cucumber long and thin (notice a theme!). Briefly boil the spinach, then squeeze the water out and sprinkle with salt, pepper and add some sesame oil. 3) 김말이 위에 김을 놓는다. 김 위에 밥을 잘 펴준다. 손질한 재료들을 밥 위에 올린다. 밥을 김 끝 부분에 길게 한 줄 놓는다. 이 밥은 김이 잘 말려있게끔 풀과 같은 역할을 한다. Put the seaweed sheet on the sushi rolling mat. Spread rice on the seaweed. Then, put an equal amount of each ingredient on the seaweed, length ways. Place a long strip of rice end of the seaweed. It will work like glue to stick the gim-bab together. This helps the roll keep its shape. 4) 손끝에 힘을 줘 김밥을 잘 말아 준다. 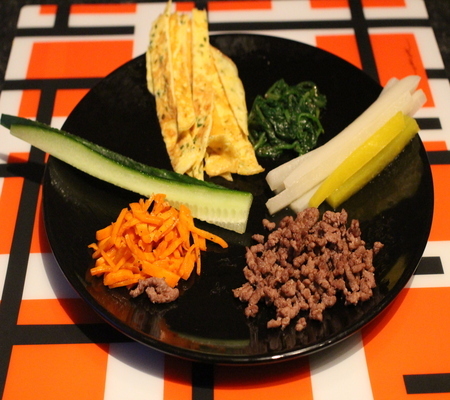 김밥 위에 참기름을 골고루 발라준 후 먹기 좋은 크기로 썰어 접시에 담아낸다. Roll the gim-bab, applying pressure with your finger tips to form the shape of the roll. Brush the outside with sesame oil, then slice into several bite-sized chunks. Click articles about Korean Movies, Traditional Wedding and more.